Luxury Edinburgh hotel with swimming pool, gym and steam room. Free Wi-Fi throughout. Luxurious bedrooms, 24 hour rooms service. 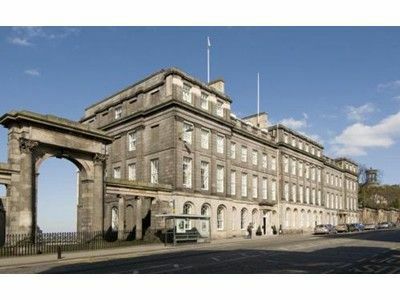 Hotel is in ideal Edinburgh location close to Waverley Train Station and Princes Street. Excellent bar & restaurant. Our Boutique Hotel offers luxury ,contemporary styled bedrooms in a great location. Within the hotel there is Elliots Bar and restaurant and there is also private dining. There is five highly versatile function rooms for conferences and meetings and a Spa with a Luxurious swimming pool, gym, sauna and steam room. Our hotel is fully approved for civil weddings and partnerships in Scotland and we have the space, facilities to provide a great, romantic wedding. Our Hotel is located at the east end of Edinburgh's famous Princes Street, the city’s main shopping district. The Hotel is close to Waverly station and the Bus Station. Bus links to Edinburgh Airport are close to the hotel. There are also many attractions such as Edinburgh castle within walking distance. For more information or to book Apex Waterloo Place Hotel Luxury Hotel in Edinburgh, please click on the 'Visit our Website' or 'View Availability' links above.We hope you enjoy your visit to Edinburgh, in Edinburgh Region. Please see the map below for our location and links to local attractions and things to do in the area.